Treat psoriasis symptoms during the day with confidence. Treating your psoriasis symptoms throughout the day doesn’t have to be a weighty process. 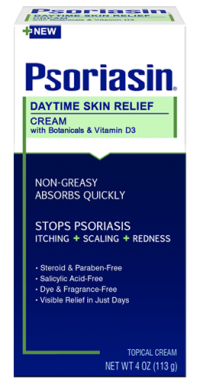 Use PSORIASIN Daytime Skin Relief Cream to soothe and heal your skin without greasy residue. Plus it helps restore your skin’s vibrant appearance with vitamin D3 and nine plant-sourced botanical extracts including aloe and mahonia aquifolium (Oregon grape). You can feel PSORIASIN Daytime Skin Relief Cream working quickly to help stop the itching, flaking, redness and related discomforts associated with psoriasis. Combining an effective low dose of coal tar in a soothing cream base, it absorbs quickly with no greasy residue. 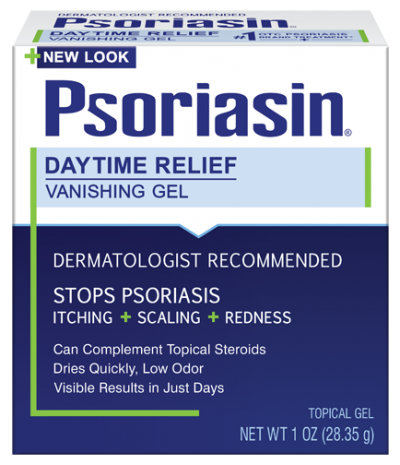 So you can use PSORIASIN Daytime Skin Relief Cream with confidence during the day to relieve symptoms of psoriasis and help restore your skin to a more natural looking appearance. Treat your psoriasis symptoms where they start.